Configuration: 18 packs per box. 8 cards per pack. 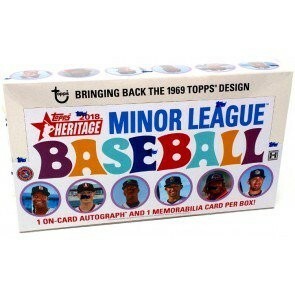 On-card autographs of the biggest MiLB stars and standouts will return with 2018 Topps Heritage Minor League Baseball. This year's release will pay tribute to Topps' renowned 1969 design, while also featuring surprise variation cards and additional low-numbered parallels. Each box will deliver one autograph card and one memorabilia card, along with two chances to win the baseball experience of a lifetime with the “Make Your Pro Debut” promotion! In addition, each box will contain a 3-card Blue Cello Pack Box Topper! This year’s release will showcase a 200-card base set, including a replication of the 1969 League Leaders cards. The top stars from across all of Minor League Baseball are featured on the 1969 Topps base card design. A replication of the 1969 League Leaders card design, focusing on the top statistical categories in hitting and pitching. A recreation of the Sporting News card design. - Blue Border Parallel: sequentially #’d to 99. - Black Border Parallel: sequentially #’d to 50. - Team Name Color Change Parallel: sequentially #’d to 25. - Red Border Parallel: numbered 1/1. Blue Cello Pack Box Topper NEW! 2018 Topps Heritage Minor League Baseball will continue to guarantee one on-card autograph per box. Autograph cards of top Minor League Baseball stars in the 1969 Topps base card design. - Team Color Change Parallel: sequentially #’d to 25. Base Card Image Variation Autographs NEW! - Red Parallel: Numbered 1/1. 1969 Topps Deckle Edge Autographs NEW! - Color Image Parallel: sequentially #’d to 25. Showcasing players who are not represented in the Base set. Base Card Image Variations NEW! 1969 Topps Deckle Edge NEW! Recreating the popular 1969 card design. Featuring game-used jersey and bat swatches of active Minor League stars. - Blue Parallel: sequentially #’d to 99. - Orange Patch Parallel: sequentially #’d to 25. - Black Quarter Parallel: sequentially #’d to 50. - Red Quarter Parallel: numbered 1/1. - Auto Relic Parallel: sequentially #’d to 10. Each box of this year’s release will deliver two chances to “Make Your Pro Debut” – the baseball experience of a lifetime!